Well actually, my first planted tank at all. But it's a start. I am still waiting on the "dust" to settle down but here is a picture from a few minutes ago. This is the 7 gallon water box, and an LED light from Amazon. The light said that it was ok for low to mid light plants. It has 22 white LED, and two each of RGB. I can run with them all on, or just the RGB LEDs for after hours. I was going to get some Java Moss but they had none. All the other plants seem to need planting in the substrate. Since I have gravel and not sand I kind a figured that was not an option. Get a ton more plants if you want to have an easy time of it. Here is my 7 gallon I cut back the plants every week. Then they grow all back. Agreed. Way more plants. And don't be afraid to plant in your gravel. Just throw a plant tab in there before planting. Yeah I just did not want to over do it just yet. I have been recently told that facilities here at work may make me remove the tank. Something about not wanting water and electronics next to each other. I know the odds are in my favor as I have not seen a tank blow out or anything, but we are a medical company and they don't like playing any odds. I plan on getting more plants. But I will be getting them from local guys and not PetSmart. The PetSmart here by work apparently has some fish people working there because the tanks look fairly good. But they only had a limited selection of plants. Since I am new at the planting I did not want to just grab plants that I knew nothing about. 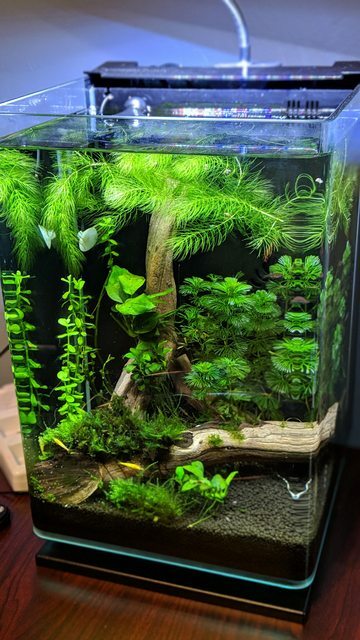 I hope to meet a few planted tank guys that I can get some clippings from. I also saw that people were planting in gravel with the tabs. I stopped at PetSmart on my way home from work and they don't carry any, even though their site says they do. I will probably have to stop at the LFS to see if they have any. Here is a photo of the tank with just the "Night Lights" on. I hope that these lights will not cause the plants any issues being on over night. I think it looks great. The RGB lights (x2 each) really bring out the red of the drift wood. I never leave lights on any of my tanks over night as I like the fish to get into day/night cycle. I always use a good planted tank soil Tropica or ADA. I found out a long time ago that trying to do things cheap cost me money and time trying to fight algae. My goal is to give the plants everything they need to be successful. An therefor I am successful and then my wife doesn’t yell at me for having algae all over the plants in the tank and the plants are not dieing on me. DonnaK and ScrubbyDick like this. I currently don't have any fish or livestock in the tank right now. Only the two plants. I am also not trying to do things cheaply. If I was just trying to be cheap I would not be getting into this hobby again. If you are not adding any kind of carbon the need for fertilizers reduces by quite a bit, x2 with basically no plants in the tank. This includes Excel. That said, a good quality all-in-one fertilizer might help if only in small doses. I use Nilocg Thrive in my nano tanks. But I use Excel as a carbon source so my growth is more than yours would be. Do test your tap water for nitrates, kh/gh so you know where you are starting from. Assuming you are using tap for water changes. Your tap may already have nitrates in it which might cause problems when adding an all-in-one fertilizer. And I will recommend more plants again. Even something as simple as hornwort which you can have floating or stuck behind your driftwood (that's how I have mine and it consumes the tank after a week). Here's my 5gal with hornwort floating at the top. I have some tabs coming and will be delivered tomorrow. I will be using them in my big tank first as I have plants planted in the sand. I will be adding them to this Nano once I get more plants for the gravel. I looked at the Nilocg Thrive and saw there are two kinds. One for a tank with shrimp and one without. I do plan on having shrimp in this tank and the big one. Are they that different that I need to only get the shrimp one? What do you mean by adding carbon? All I knew was carbon was normally put into a filter to clear the water of chemicals and other things. I have a bag to put into the filter of this Nano if it is ever needed. Is there another use for it in planted tanks? I am looking into ordering more plants soon. Just wanted to make sure I get the right things for this tank. I use ThriveS but that's due to my 5gal tank. I didn't want to chance it with my shrimp in that small of a water column. 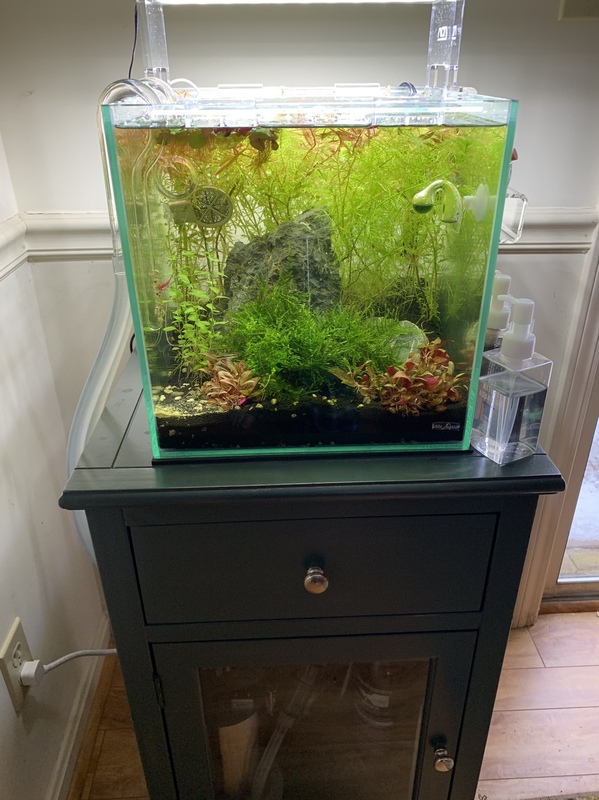 The difference is that ThriveS doesn't have any copper, which shrimp are especially sensitive to, but plants like to have in small quantities. In a larger tank, with well and fast growing plants, it probably won't be an issue and I see people on here using the regular Thrive with shrimp without adverse affects. Smaller tank I wouldn't chance it. There is already a lot of tank parameters that can, and do, fluctuate rapidly in such a small tank. No need to add cooper to the mix. The one plus that the ThriveS has is that its lower in nitrates, which if you happen to have nitrates in your tap it's nicer to use since it doesn't artificially raise your nitrate level to high. Plus it has some calcium, which the regular doesn't, that helps shrimp with molting and general exoskeleton health. Provided you don't already have a lot of calcium in your tap water. By adding carbon I meant either using co2 injection (Edwiser is using co2 in his tank) or using Seachem Excel, a bio-available carbon supplement(like a fertilizer). Plants need a carbon source for growth and it's usually the limiting factor in growth in non co2 injected tanks. The more carbon (co2 or excel) you have in the tank the more the plants need fertilizers to keep up the growth. The carbon in a bag you refer to is not the same thing. As a side note I've never used carbon(in a bag for removing impurities) in any of my planted tanks. Not that you can't. Many do. If the plants are growing well and strong, I just don't see the need. Hope that helps and keep us posted as to what you get. Thanks for the info Paul. I tried to buy some Thrive this weekend but the LFS did not have it. Since I wanted something I bought some Seachem Flourish Advance. I figure that I can use it while waiting on the Thrive to be shipped. I also picked up a few more plants. One for my big tank and two for this Nano tank. For the Nano I picked up some Java moss (I think that's what it is... right hand side of the tank in the picture below.) I also picked up a moss ball. Not sure how much good it is but every picture I see of shrimp they seem to always have one perched on a moss ball. Nice! The shrimp will love the Java moss. I don't have experience with moss balls but I assume they collect lots of stuff that the shrimp pick at. Kind of like the Java moss. I have a bunch of Java moss in another tank that breeds cherry shrimp pretty well. I'm thinking the java moss helps allow the young shrimp to grow up big enough to not be eaten by fish. Fyi, don't worry about the white fuzz growing on your wood. If you get shrimp before it does go away they will love it! I did notice tonight that you are from Texas. It might be a good idea to check the kh/gh of your tank/tap water if you are wanting shrimp. If it's above 10 dKh you might want to look into bringing that down a bit. I did not think I had to worry about the white fuzz. I recall seeing it in many of my earlier tanks. I have bought both the kh and gh testers but just keep forgetting to bring it to work. I am very curious as I believe that the water source I am getting my top off\change water from is filtered. I really hope that it has pulled some of the garbage out. Ok, maybe not good life but life none the less. I was looking at my tank today when I saw my first living thing in the tank, besides plants that is. A worm... sigh... Last thing I added to the tank was the Java moss and the Moss ball. I guess there was at least one worm as a hitchhiker. I am not worried about it though. Still no other life in the tank and not really anything for him to eat. Unless he eats the liquid plant food.